Indian Express and Sakaal times today carry two lovely articles. And DNA again mentions it in their second page.Click on each one to enlarge and read. Times of India and Pune Mirror too have featured it. A big thanks to all of you who have been so supportive, so encouraging with your comments. u knw u can send yur books for reviews by... very cool - book reviewers on net. it would be great if they give you a good rating. hey brilliant stuff! the media cant get enough of you! Vins: Its TODAY and my kids have made a bookmark for you.So you better turn up. This is fantastic. Congratulations!! All the best for the book launch. Hey Preeti, the book launch in Pune today was really impressive and you managed to hold the reader curiosity throughout the eve. It was a novel experience for me to attend the same and given you too blog, it gave me an extra chord to relate to you. I too started a blog out of pain and guilt, and i evolved with time. 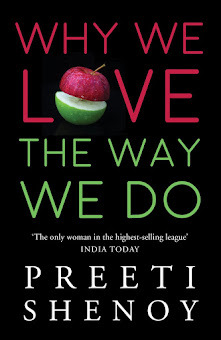 You truly rock Preeti. I concur with the preface of your book where you relate the life's experiences to a candy and bubble gum. I was lucky to have a book signed by you. 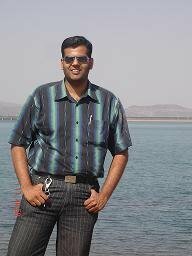 I was Sameer, whom you signed a book for and i asked a question on how to deal with a nasty experince on the blog. Media critics!! Thats great!! Hope you had a very good time at the launch!!! Congrats!! I'm so glad that I know you (so what if it's in the virtual world!). How was the launch today dear? Do let us a little about it when you have some time. Wonderful reviews..and they are so very true! I imagine you are exhausted by the events of Saturday?..and I also imagine that reading these reviews must seem like you're reading about some other person?...well it's you..you have worked and lived for this moment..now your beautiful words are going to reach a whole new audience and as far as I am concerned...the world will become a better place because of you! It was really nice reading the reviews and i can sense the happiness you and your family must be experiencing with these reviews .. I hope the launch at Pune went ahead well .. Please let me know when u ll b coming to Chennai .. THANKS to YOU Preeti for sharing your perspective on life with others and making them feel a little better. I have enjoyed all your blogs, keep writing. Spent the past few weeks reading through the archives of your blog. You know this is one of the most inspiring and honest blogs I have come across in the process of blog-hopping. My mom is also a big fan of this blog. This is what she said," Her writing shows what a good individual she is". Honest and down to earth, the blog speaks for you! Waiting to lay our hands on the book. Fantastic Preeti. Great show ! Congrats... I might also come for the launch @ Crossword, Bangalore. Can you preserve a bookmark for me? congrats preethi. u have done it. we all r proud of u. hope u r enjoying urself. looking forward to reading the book. all the best for your blore launch. No words to express what I feel. PROUD. I think that sums up. However a little piece of advice, I am taking that liberty without your consent, Please do keep your feet on the mother earth. Xh: Well--waiting to meet you all. Jack: Oh yes--I will.My children, my husband and good friends ensure that :-) Whatever i achieve I shall truly remain just a mother of two. Manasa: Should I tell the children to personalise it or shall i just keep one for you from what they made? Chitra: tahnk you.It was fantastic.Will write a post. Raghu: I guess if you place an order, the online sites will get it for you.I saw it listed on e-bay. RM: Pleasure is all mine. Meenu:Do call me preeti. Thank you so much for your note and your kind words.Most probably there will be a luanch in chenaai--but not in October.I dont know when.And if there is one, will surely tell my kids to make one for you. Niall:Thank you my friend. if even a few people have been moved by the message in my book I will be happy. Prats (Pune): it was great to meet you.Thanks for coming! Sameer:The pleasure was all mine.For me I was excited to meet people with whom i have interacted Virtually. I have visited your blog and left comments too.Thanks for coming and thanks for the write up about the launch.I appreciate it. Tessie: have already told my kids about you and they have personalised the book marker for you. Varun:Thanks so much! Thanks for the e-card too! I really appreciate your gesture and the thoughtfulness. Congrats! You are living my dream of someday becoming a writer. Finally the day has arrived when you stand next to the print of your book...and i'm sure it must have been a great event. Congrats on all the rave reviews and God Bless!!!! 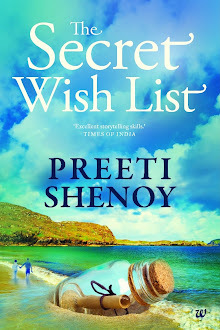 Awesome Preeti and well deserved.. keep up the good work.. now let me go see how I can get my hands on a book!! 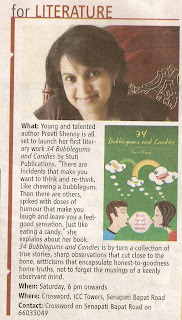 Was at your reading in Pune crossword and was so proud to see a Pune blogger make it so big. Been reading your blog silently for long .. :) You rock!! I'm so sorry to have missed the book launch... I was looking forward to meeting you there! Something urgent came up and I was called back home while on my way to Crossword! Thanks for the earlier info. Gosh Preeti, you were right when you said that you had a great supportive system to accomplish everything that you have. Not that you could not do anything without them, but I think success is a sweeter when you have somebody to share it with, burdens are little less cumbersome to carry / worry when you have someone else also to help you out! Congratulations Preeti. I am very happy for you! Annie:Thanks! Appreciate your letting me know. Vidya: very true.I do feel blessed.And thanks for that call the other day. Ceedy: Guess it will come to the US only after penetrating Indian Stores first.Thanks for checking! Preethi;Thanks! U live in the US right? Then it will take a while. Thanks Ceedy! Do let me know. this is crazy !!! I had left a comment congratulating you but i guess it didn't go through. Anyway here it goes again, congratulations on all the well deserved recognition and success. It must be very creatively fulfilling. I hope there are many more books to come in the years ahead. Yayeeeee!its rainin praises!! !yayeeeee!all of'em so well-deserved! Ranjini:Thank you.Yes I am working on my second book. 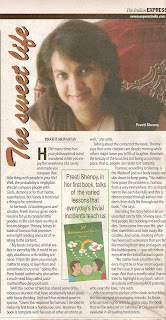 Preeti I went through your times india article. Congrats for the book launch.